When I first heard about your signing in the offseason, I was more than skeptical. I saw the mediocre season you’d had with Houston and New York last season, and upon hearing we signed you for $8 million, which is almost as much as I make in a year, I lambasted the move. Perhaps it was from the years of rivalry that’s sprouted between the Cardinals and Astros, but I thought it was too much to invest in a 35-year old with bad knees. One month into the season, allow me to say, so far, I’ve been wrong. And I’m happy about it. Yes, Lance, I apologized. No, I'm not going to repeat it. Perhaps it was the weight you lost in the offseason. Perhaps it was the transition to St. Louis. Whatever the reason, you’re stroking balls harder than my ex whenever she has to pay rent. What? Maybe she was a softball player. But please, accept my apology, Lance. On top of all the numbers you’re producing, I also admire the fact that you’ve jumped in and become one of the clubhouse leaders. You didn’t disrupt the synergy of the clubhouse; if anything, you’ve made it better. I’m hoping your health holds up this season and you can parlay that into an all-star season. The Cardinals used to boast the MV3, which consisted of Albert Pujols, Jim Edmonds, and Scott Rolen, augmented by Larry Walker and Edgar Renteria. This year, the Cardinals’ core three hitters could be even better. Pujols is still struggling with a low average, but his average has jumped more than 100 points in roughly two and a half weeks. There’s no reason to think he won’t be above .300 soon. I’ll admit, I was wrong about my prediction that he’d be at .300 by April 26, but he was much improved. Berkman and Matt Holliday are both hitting over .400, paces that certainly won’t last the entire season, but they are absolutely raking at the plate. Epic. Obviously, it won’t happen. Each player goes through hot/cold spells, and the chances of hitting .400 now are pretty remote. Lance’s power numbers are incredibly skewed when you look at his home/away splits. He’s hitting .432 at home, but has only six doubles and three RBI in 11 games at home. In 11 games on the road, he’s hitting .391, but has eight HR and 18 RBI. As for this year’s corollaries? How about Colby Rasmus (.316, .400 OBP, 3 HR, 10 RBI, 18 R) and David Freese (.358, 2 HR, 12 RBI)? Not too shabby. Seems like everyone’s just absolutely harping on the bullpen for at-times shaky performances. I’ve noted a lot of people who rail on relievers, even if they went the previous week without allowing a run, for one bad performance. 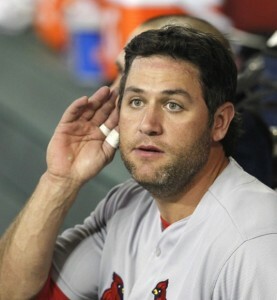 Sure, I got upset the other night when Holliday made a great sliding whiff. I nearly went into conniptions when Berkman got a bad angle on a ball and allowed a double on Wednesday. The relievers aren’t perfect, either. But you have to allow them a little leeway. To expect a group of pitchers to have a 0.00 ERA for an entire season is a little unrealistic. Now, there are three relievers who have been struggling all season. Trevor Miller hasn’t retired a batter his last five outings. He’s faced one batter each time and given up two hits and three walks. As our left-handed specialist, he often comes in specifically to get one person out, and he hasn’t done that. To wit: he leads the team in appearances (12), yet has pitched only four innings. Ryan Franklin‘s struggles have been well-documented here; I’m not going to rehash them. Before he went on the disabled list, Bryan Augenstein had been inconsistent, giving up 6 earned runs in 5 2/3 innings. Combined, these three have surrendered 17 earned runs in 17 2/3 innings, an ERA of 8.66, to go with 11 K, 10 BB, 5 HR, one save and five blown saves. Remove them from the equation, however, and in 55 1/3 innings, the other relievers have given up 10 earned runs, an ERA of 1.63. They’ve surrendered one HR and have struck out 55 batters and walked 20. They also have five saves in six opportunities. As I posted on the STLtoday forums yesterday, many of these guys are still adjusting to their roles. Jason Motte is having a superb season as a setup man. Mitchell Boggs is acclimating himself to the role of closer. Fernando Salas is in his second season in the majors, Eduardo Sanchez his first. These guys will give up runs from time to time, but baseball, much like life, is growth through pain. Don’t freak out over the apogees and nadirs of the season. See where the Cardinals are at the end of the season and judge accordingly.